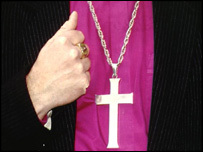 Almost one out of every two members of the clergy believe there are plans to abolish their jobs, according to a poll. A survey of 1,000 members of the Amicus union's clergy and church workers section indicates one out of every three is facing changes to their jobs. Many said they had been treated unfairly or dishonestly. And fewer than one out of every six had been offered any financial assistance when asked to move jobs. The survey covered mainly Church of England clergy but included those from other faiths. Amicus national officer Chris Ball said: "Christmas is suppose to be a time of joy, quite clearly there is very little joy for the clergy who, unlike the ghost of Christmases yet to come, do not know what the future holds for them in their current posts." They were "operating within a climate of uncertainty, inadequate management" with "little or no legal remedy to problems that occur", he added. "It is unacceptable that 36% of clergy are facing changes to their roles and that the structures that notify these changes to our members only reach 17.7% of them."